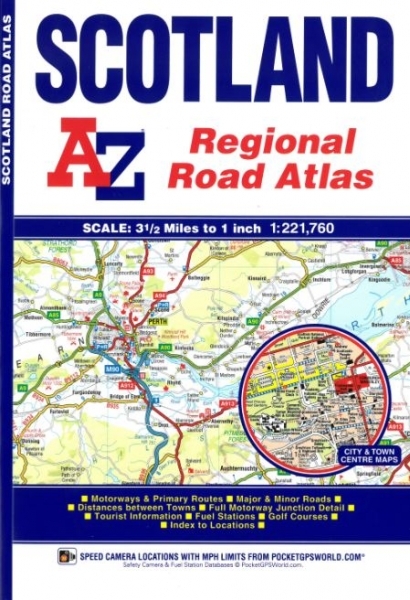 This A-Z map of Scotland is a full colour atlas featuring 92 pages of road mapping covering the whole of the country. Instantly recognizable and easy to use, A-Z road mapping includes the following features: Motorways with full junction detail, primary routes and destinations, A & B roads, under construction and proposed roads, service areas, tolls, mileages, national, county and unitary authority boundaries. Selected safety camera locations with speed limits. Selected fuel stations. Cairngorms and Loch Lomond & The Trossachs National Park boundaries. Hill shading sourced from Geo-Innovations www.geoinnovations.co.uk.